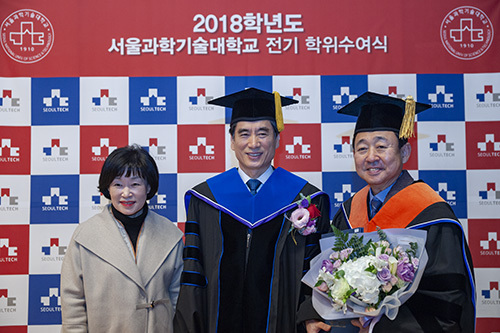 SeoulTech (President Kim Jong Ho) hosted the commencement ceremony for the Class of 2018 at the 100th Memorial Hall on February 22. The President, Vice President, Dean of Graduate Scho, professors, various faculty members, and family members of the Class of 2018 joined the graduating class with 2,200 people attending the ceremony. 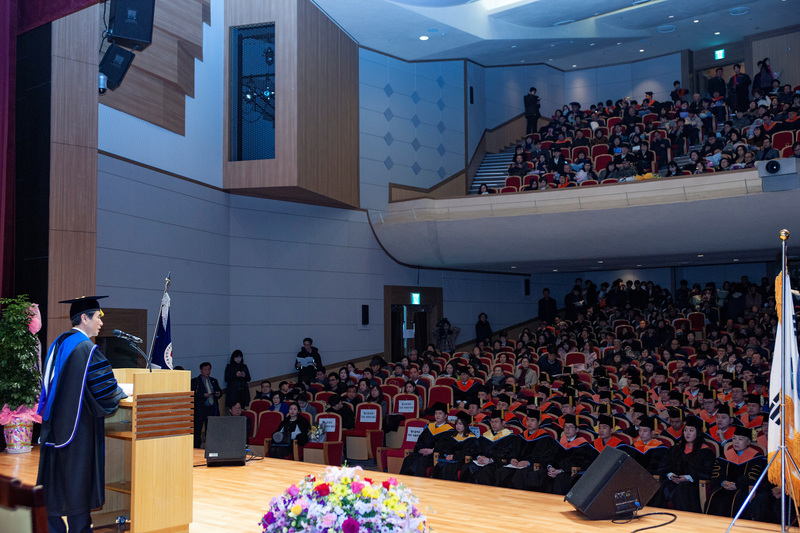 After the Dean of Academic Affairs presented the academic report, President Kim gave his commencement speech. 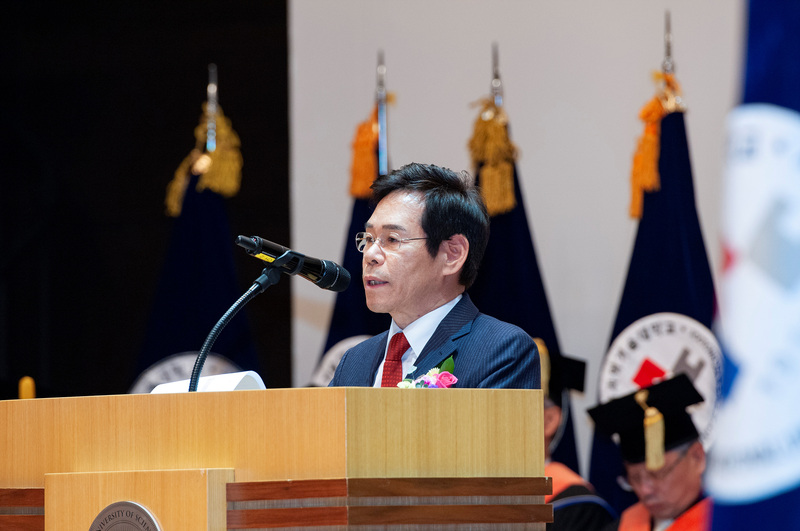 Vice President of the Alumni Committee Kim Sung Kwan and Honorary Dean of the College of Engineering Yoo Byung Chan also gave speeches. 53 doctorate degrees, 7 master’s degrees, 8 bachelor’s degrees, 6 undergraduate academic excellence awards, 1 excellence in academic paper award, 1 undergraduate meritorious award, and 1 alumni award were awarded with a total of 1,869 degree candidates given degrees. Students who received excellence in academic paper awards from each program at the graduate school level are listed below. 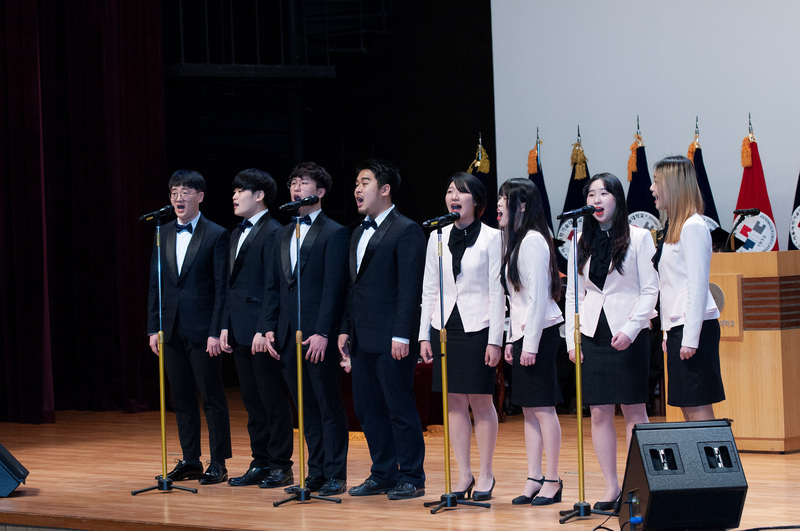 The commencement ceremony ended with all attendees singing the school song. Railway Safety Department 17610099 Kim Heung Soo A Study on Railway Safety Culture through Learing Culture and Responsibility Mind of Driving Workers : Focused on the Organization, Operation Work, and Working Stress. : FOCUSING ON THE "R&BD SUPPORTING PROGRAMS"
Department of Energy System Engineering 157713103 LEE SONGWOO A study of central cooling and heating system on apartment houses. I congratulate all of you on your honorable graduation today. We have 53 doctorates, 322 masters, and 1,494 undergraduates graduating today. I know that each one of our graduates will begin their journey to becoming proud SeoulTech graduates who will shine. I am sure that each and every one of you spent long hours and invested hard work into your research and future path. In a society in which the economy is experiencing slow growth and low levels of employment, you have probably worked harder than ever. I feel your worries and know that you have put more into your studies than ever before. You have all done a great job and I would also like to thank all of your family members for the love and support that they have shown as well. SeoulTech has experienced surprising levels of development during your time here. We are seeing increased performance from our freshman, and we have grown to become a global university that has exchanges with 280 universities in 57 countries. SeoulTech was also second among national universities and placed 19th among all universities in Korea according to the 2018 JoongAng Daily University Review. 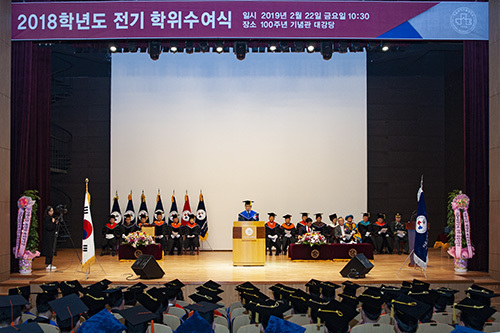 We placed first in entrepreneurial education, fourth in venture entrepreneurship, and seventh in academic scholarship rates as a result of focusing on students and their education, and have become one of the greatest national universities in Korea. We were also included in the top 3% of universities worldwide according to the QS University Review. This is a representation of SeoulTech and the global competitiveness of our graduates, and because of our graduates, SeoulTech has been able to develop so much. I thank each and every one of you for helping us to develop even further. We will work harder to grow into a university that offers new technology and values to compete with the best universities worldwide. As I thank you today, I also want to provide you with some words that I hope will be of help to you as you graduate. As you are aware, the Fourth Industrial Revolution has now begun and a new society that will have unimaginable development in scientific technology in the fields of big data, artificial intelligence, robotics, and other areas will be present within the next ten years. We will witness a world in which everything is connected and a hyperconnected society where people are connected to one another through digital means such as social networks like YouTube. In a recent TV program on Generation Z, we were able to see how people born in the late 1990s and early 2000s are using YouTube and SNS to communicate, create new economic activities, and raise their voice on social issues. This shows that we are already becoming a hyperconnected society. Breakthroughs in scientific technology and social networks present a paradigm shift in Korean society and the world. In this transitional period, we may lose our jobs and humanity to artificial intelligence and robots, and there are worries that there will be greater divides between the digital generation and the generation of the past. However, if we are armed with a spirit of cooperation and creativity, we will be able to revolutionize our society and be given an opportunity to change the world. SeoulTech is leading the charge in cultivating future experts through our prowess in scientific technology. Aside from this, we will require the communication skills, collaboration skills, critical thinking skills, and creativity skills. While I agree with all the 4Cs, I will focus on collaboration and creativity today. Without communication, collaboration cannot develop, and creativity cannot develop without critical thinking. Many anthropologists believe that it was communication that allowed homo sapiens to become the first collective intellectual group to claim the world. I believe that one of the most essential factors that allowed for this is collaboration. First, collaboration with groups both internally and externally, and second, collaboration between generations. However, after the second industrial revolution, the world used the concept of freedom to promote selfishness and competition, which has resulted in our overlooking of the importance of collaboration, one of the most essential factors of human growth. The recent low levels of employment have created more competition and an unfortunate belief that we must be selfish in order to survive in this competitive environment. Now is the time where we must actively seek to communicate with others both in the respective groups that we are in and generationally. Both online and offline, different groups and generations must focus on the spirit of human networks and seek to make changes to society. I hope that you will be at the lead to create a world in which we support one another and live together. Become a pioneer in instilling collaboration and unity in the world. Creativity is another essential factor that lead to the creation of collective intelligence. Robin Williams (1951-2014) was a famous American comedian who once said, “No matter what people say, words and ideas change the world.” Steve Jobs’ creativity gave us the smartphone and created a whole new world for us. In our society today, rather than praise individual creativity, we look down on such things. It is now time for our society to shed the totalitarian and authoritarian tendencies and change into a society that values individuals and their opinions. However, there are still many cases in which new ideas are not accepted and shut out. I am grateful that the new Generation Z that is leading the digital transformation is showing their creativity and even creating economic value. The YouTube videos and creative webtoons that are created by Generation Z are now leading to entrepreneurs and jobs. We must all work together to create a society that praises creative ideas. SeoulTech will also continue to develop our creativity education and expand our entrepreneurship education with the help of our entrepreneurship support team. I spoke of collaboration and creativity today, but I would like to end my speech by saying that it is how we decide to approach this issue that is the most important factor of all. We must be open to all the differences in our society. Collaboration only occurs when we accept and love the people who have different characteristics, cultures, values, and thoughts. Only in such a culture can creativity begin to grow. We must all have a spirit strong enough to accept all differences in order to cultivate collaboration and creativity. I believe that all of our graduates who are willing to accept diversity and create a human network that seeks creative solutions will lead our society. We will also work hard to further develop into a university that you are proud of, and an institution that is a global pioneer that offers an education that awakens collaboration and creativity with an open heart. I ask that you continue to support our cause as the development of our school does not just come from our faculty but our alumni as well. Graduates, open your minds and grow to become the first movers in each area that you seek. Become leaders that create a new society based on collaboration and creativity both in Korea and abroad. Let us all seek to work together to create a network that shares. Our institution has grown amazingly since its establishment 109 years ago, when our country was facing the hardest of times, in order to teach scientific technology and contribute to the national cause. I hope that you will remember your experience and time here at SeoulTech whenever you face adversities and know that you can do anything. I also ask that you show interest and love to your alma mater and cherish your memories here at SeoulTech. We will never forget you and will always support you. Once again, congratulations, and I hope that a bright future is ahead of you.